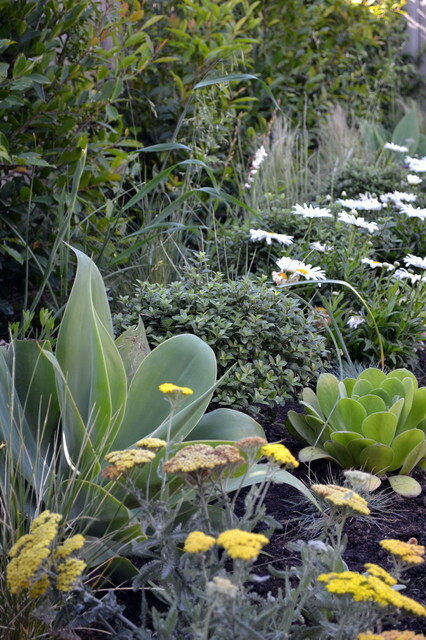 A border combines yarrow (Achillea), shasta daisy (Leucanthemum), Mexican feather grass (Stipa tenuissima), foxtail agave (Agave attenuata), a mix of fescues (Festuca spp) and gaura (Gaura lindheimeri ‘Alba’) against a pittosporum hedge. Gotta rethink the whole cactus thing. They aren't all prickly and ugly.